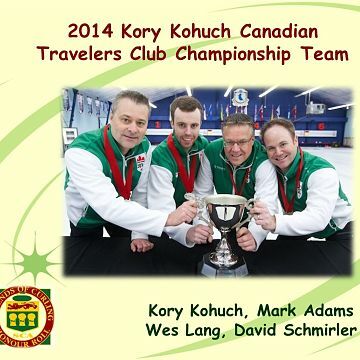 Ontario’s Kerry Lackie and her team from the Westmount Golf & Curling Club in Waterloo, and Saskatchewan’s Kory Kohuch of the Nutana Curling Club in Saskatoon take home the 2014 Travelers Curling Club Championship champions after two exciting finals at the Mayflower Curling Club in Halifax, N.S., held November 24 to 29. Saskatchewan’s Kory Kohuch and his team of Mark Adams, Wes Lang and David Schmirler from the Nutana Curling Club in Saskatoon started strong with three consecutive steals, but Ontario fired back, scoring three in the fifth to even the score. Ontario – Michael Hull, Matt Mills, Luke Johnson and Lucas Parafianowicz of the Cataraqui Golf & Country Club in Kingston – was held to a single in the seventh, giving hammer back to Saskatchewan for the final end with the teams tied 4-4. Ontario’s steal chances got tougher when second Luke Johnson’s guard attempt picked, and Saskatchewan kept the pressure on with lots of rocks in play. With the clock ticking down, Ontario’s Hull needed to freeze to the counting Saskatchewan stone on the four foot and came up just short, giving the team from Saskatoon the 5-4 win – and the championship.